Game Stars has just closed the 1st stage of the Token Sale and moved up to the 2nd one. 20% bonus on GST tokens purchase is available for Token Sale participants until June 13th. 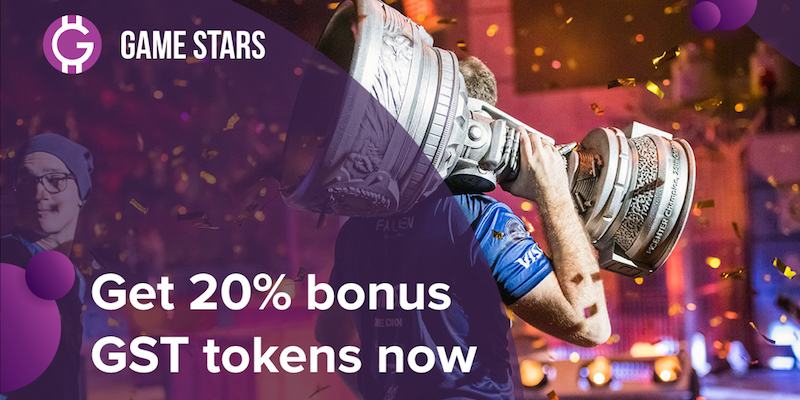 Game Stars platform offers solutions for eSports market problems and tends to make the industry friendlier and more convenient for its players. The project is growing under the aegis of a great team. People with a great working experience have joined Game Stars and assist in major fields like platform development, marketing, PR and more. Advisor Daniel Laufenberg has been leading teams and architecting client solutions for a wide range of problems in tech giant like Google and Cisco over the past 4 years. He currently works as a senior development engineer in Exadel and responsible for all stages of the development life cycle of products. The token is a means of payment in Game Stars. The platform solves eSport problems and will attract market players. Tokens will be allocated for exchanges after the end of the Token Sale. GST holders will be able to sell tokens at a higher price. More detailed information about the tokens and how to use them you can find out in Game Stars White Paper. Game Stars platform is focused on settling eSports problems: lack of market infrastructure; lack of funding for beginner cyber players; non-payment of prize money, unfair tournaments. Smart contracts are issued for each player together with personal tokens. Players can sell their tokens, raise funding for their professional development. Sponsors can evaluate cyber sportsmen based on players statistics, support the most promising gamers and get a share of their income. Everyone now can organize own tournaments. Terms and conditions are powered by smart contracts. Thus the problem of frauds is excluded, prize-money payouts are made completely and in time. Find out more about the project and participate in the Token Sale at the official website. There is an opportunity to get 20% bonus tokens until June 13th, 2018. Subscribe to accounts on Facebook, Telegram, Telegram chat and get the latest news. Wow, the prototype is only two months away! That’s exciting news! I cannot wait to try this thing! GameStars, in my opinion, is the hottest cybersports-related project going right now! That’s just my opinion anyway!